SEE IT WHILE YOU CAN! THE GODZILLA ENCOUNTER FOOTAGE IS HERE!!! – SKREEONK! SEE IT WHILE YOU CAN! THE GODZILLA ENCOUNTER FOOTAGE IS HERE!!! Its been leaked! Check out San Diego Comic Con’s Godzilla Encounter Footage while you can! Less typing MORE WATCHING! Check below for my screen grabs! UPDATE: Warner Bros has taken down the original youtube video – but you can still find other postings scattered about. For now, check out the comprehensive gallery of animations and photos below. And for when they take it down – I’ve managed to screen grab several points of interest – which you can see below. The design is indeed very close to the maquette we’ve all been pouring over – and features a more dinosaur-like maw, closer to the bust (I’ll post both sculpts below these grabs). This is a shot of the Big G’s big entrance. In motion, he is absolutely enormous – a huge, lumbering behemoth of spiked scaly hide. 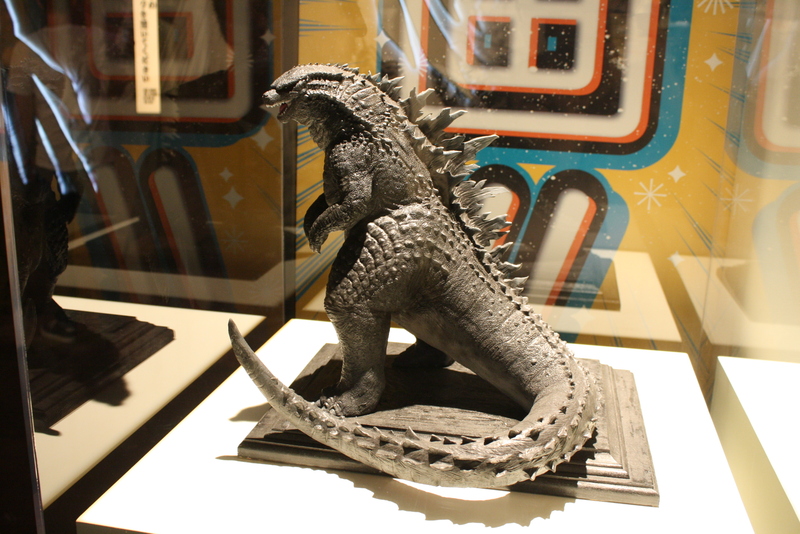 Everything from the shape of his maw to the dorsal spines matches the full body maquette. I’ve outlined the silhouette, which you can see below. The next picture is of his neck/shoulder region. The horizontal frill of the neck has been toned back from the maquette – and the “arm spikes” that Mr. Akira Takarada was referring to are very present. 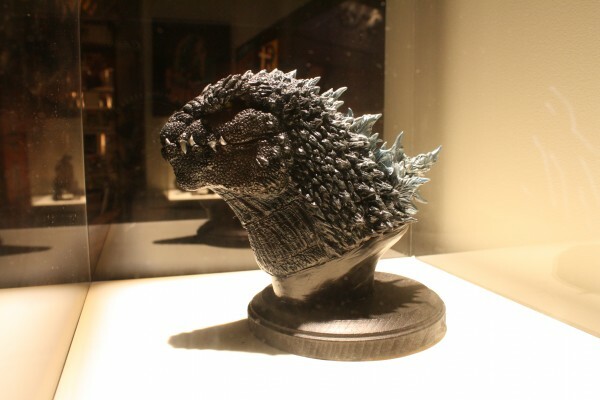 Godzilla will definitely be sporting some heavy armor – and it looks great! Now here are some shots of his close up reveal – a version of which we’ve posted before. I grabbed all of these myself, and we get several good looks at his eyes and browline. Look at those glowing amber eyes! It definitely appears as if he will have some Heisei-esque glowing irises amongst a white eye. Very cool. He looks absolutely pissed off. This shot definitely reinforces how much the brow line invokes the feel of the G’84 suit. Now this shot is a bit harder to make out, but this is the opposite eye once Godzilla has turned his head. I’m definitely diggin’ it. All in all, we now know the design will end up close to these two sculpts (seen below) – and after seeing it in motion I am 100% on board. The big guy is back – and he looks exactly like you’d want a big-budget Hollywood version of the Toho suits to look. Well done, Legendary. So great, thank you for the heads up! I DID get to see the video before it was removed (yay!). I LOVE Godzilla’s movement. The design is pretty cool. Only *slight* issue I have is that his spines may be too small… at least that’s the impression I got from what was shown. Maybe the spikes are larger further down the back (keeps fingers crossed). hmmm..i think this godzilla hasn’t fully grown..he is merely just a juvenille or a subadult..
We have the full download, a couple clips, and mor GIFs. You’re welcome to re-host any of them, here. Why is is head so small and his neck so curved, he’s starting to look like a lizard-dragon. Why can’t they stick with the 2004 design from either Tokyo SOS or FInal Wars with minor modifications to color for anamorphic widescreen and 3D? Better yet, why not release SOS or Final Wars here in the US with a change to the sound-track to fit the times instead of another “hollywood style cgi makeover”. He’s not Joan Rivers. Next Post SDCC Wraps Up, and We’ve got the Good, the Bad, and the Shwaaat!? Previous Post Official Photos of SHMA Battra Released! KaijuCast has a X-Plus Interview! Its a Collector’s Update!